More than 300 students at University of Nevada: Reno stood For The Kids treated at Renown Children’s Hospital]; raising more than $19,000. These funds will go to help support the hospital’s greatest needs of premature baby monitors. 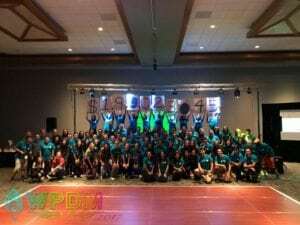 During the event, students took a Zumba class, joined in on the moral dance, played with the miracle kids, but above all they came together to help raise more than $19,000. Giving the students the incentive to raise money such as when they were offered an anonymous $1000 match donation, or seeing one of their peers buzz their heads proved to push the dancers to raise more. Hearing Renown Children’s Hospital Champion Child’s story moved the students to come together for such a great cause. It was definitely a reminder as to why they were there, and why they were dancing for hours on end. Part of the Miracle Network Dance Marathon Program since 2015, Wolf Pack Da nce Marathon has helped sick and injured kids like Tennyson Hunter receive the best care available. Diagnosed with Evan’s Syndrome, Tennyson has faced a life in and out of Renown Children’s Hospital. Even so, this did not stop him from being the funny, brave young boy he is at the dance marathon. He joined in on the Zumba classes, took pictures in the photo booth with family, and made various friends with his fellow dancers. Jumping on stage with Poly Nui, a Hawaiian dance club, he outgoingly followed their steps and hulaed alongside them. Everyone at the event could not help but fall in love with Tennyson. Overall, he was a demonstration of what a grand impact Dance Marathons have on children like him, from allowing them to enjoy a fun day surrounded by new friends and family, to showing people where their donations go towards. Panda Express, a Children’s Miracle Network Hospitals partner, generously provided students food during their event. Learn more about how Panda Express is supporting the charitable need of children’s hospitals.